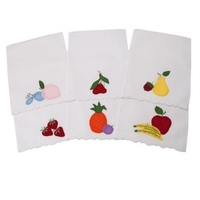 Set of 4 Assorted Cocktail Napkins. 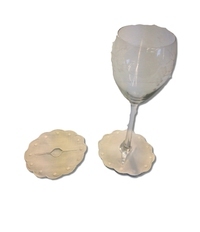 Glasses made of Organdy with your Favorite Beverage inside. 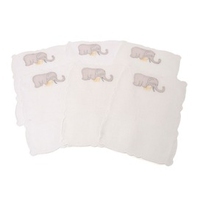 Ecru or White Linen. 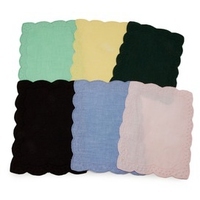 All Linen with Swiss Dots and Scalloped Edge, Available in six colors. 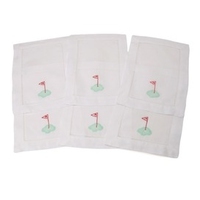 White, Ecru, Pink, Red, Mint and Dark Green. 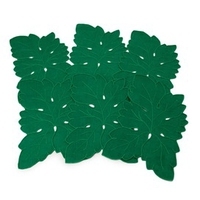 The Traditional cocktail Napkin in Fun Colors 6" x 9"
Leaf Shape Linen with Cutwork and Embroidery, 6" x 9" Available in Ecru, Green and White. It's cocktail time! White linen with replique hem. 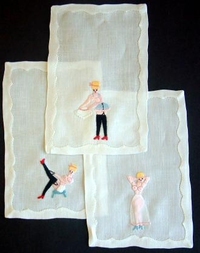 3 patterns assorted French Maidens. 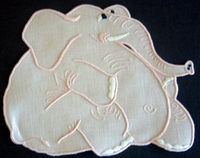 Made on pure linen. 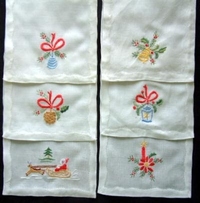 Sold in sets of six, two of each pattern. 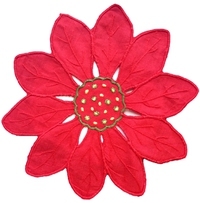 Pink flamingo embroidered on white hemstitched linen. 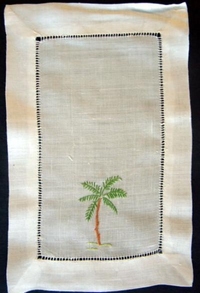 Hand embroidered palm tree on white linen. Hemstitched edge. 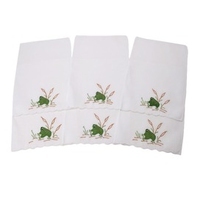 Appliqued and Embroidered Frog on All White Linen, Handrolled Edge, 6" x 9" Made in Portugal. Hospitality pineapple. 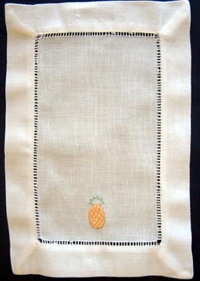 100% linen with a hand hemstitched edge. Cocktail Time. 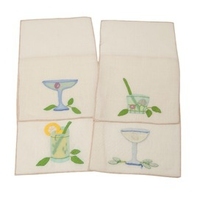 Hand embroidered martini glass on pure linen. Playing Cards. 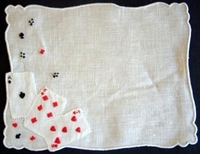 Hand embroidered cards and scalloped hem.